The leaves of fall: vibrant and speaking of the fleeting moments of life. Full of beauty; a seasonal poem. That is, until it starts raining and they’re mucking up gutters and getting slippery, making you slip while walking to work, thus messing up your new “grown up” work outfit and resulting in nasty looks from the boss. Not that we'd know. 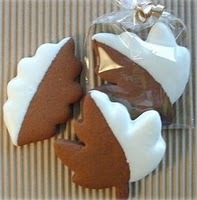 Here's a much more rewarding perk of the season: leaf-shaped, chocolate-dipped gingerbread cookies by A Sweet Design. This Seattle-based cookie wholesaler, headed by the friendly Pamela Rose, is known for their wonderful, thick, spicy gingerbread and sugar cookie creations (which are sold in various coffee shops in the area, including Cherry Street Coffee). And happily, they will be debuting their fall gingerbread selections this very week: leaf cookies at Chocolati in Greenwood this Wednesday afternoon, with wrapped cookies to follow next week in all three locations. No manual labor necessary, and you’ll certainly have no trouble cleaning up this fall treat. 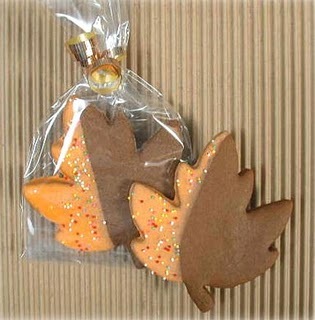 Leaf cookies available starting October 17 at Chocolati in Greenwood (8319 Greenwood Ave. N, near corner of 83rd); wrapped cookies available at all Chocolati stores starting next week; locations online at chocolati.com.